though, in my area, spring seems to be taking it's damn sweet time getting here, we did have a burst of warm, almost hot, weather the other day and that put me in the mind of summer. and of what to read for summer. to me summer has always represented a fine time to read the stuff you've been dying to read. this prob'ly goes back to school days when you were always being forced to read what the teacher made you read. summer though...that's free time! of course, MY summer reading list always comprised at least one or two runs of one comic book or another, a chance to go back and re-read something that you haven't read in years. 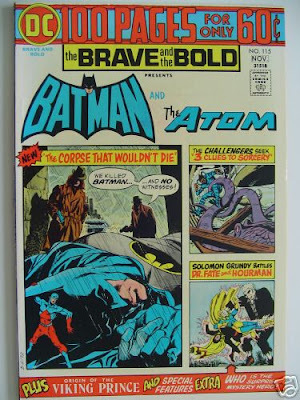 this summer i'm thinking about getting out all of my old batman/brave and the bold's, a series i loved as a kid, not only 'cause nick cardy had drawn a good handful of them but also because of the awesome jim aparo, who followed nick on the series! he did some great stuff, moody and dynamic, and maintained batman's shadowy countenence, depicting him--like the shadow--as a creature that could easily disappear into the night. and seeing batman paired with characters from every corner of the dc universe--that was always fun! maybe not all that plausible, but...it was comics! 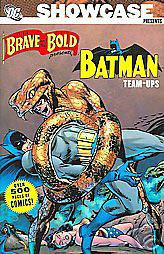 a good way to catch these old issues is to pick up dc's showcase series brave and the bold. although they're in black and white and i don't think they get up into the aparo issues yet. maybe volume two. on the flip-side, i'm also planning on getting out my marvel team-ups to re-visit marvel's amazing pairings of their galaxy of stars with everybody's favorite wall-crawler! also a fabulous series and also available in the more economical essential series! i loved these too as a kid and was really honored to get to write a marvel adventures version a few years back. 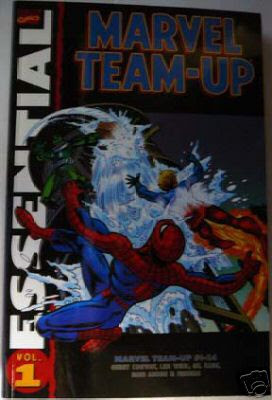 and of course, mike wieringo had everything but the marvel team-up title on many issues of our sensational spider-man run! but i also remember buzzing through at least six or seven good books in a summer--some fantasy or science fiction book i had found or, later, some horror. so many great summer days spent outside in the grass or on the beach reading a good book in the sun. and sometimes, it's the book. one excellent summer book--that also happens to be about an excellent, adventurous summer, is boys life by robert mccammon. though the time period is about ten years before i was having my own adventures in the summer sun, it felt just like the wonderfully lazy, incredibly endless summers that i remember! the ending rumbles around a bit, finding it's one true conclusion, but other than the the book is a pure piece of summertime gold! another one that i actually just stumbled over because of it's suggested horror elements is richard laymon's the traveling vampire show. there are vampires, and it does have some very suspenseful horrific moments, but this book is more a celebration of the surreal, directionless, anything-can-happen promises of summer. i've read a few other novels by laymon and they're usually good, solid horror stories, but they were different to me because they didn't capture the reckless abandonment of summer that this one does. don't get me wrong--it's not great literature--it's a paperback version of an exploitation film and somewhere along the line laymon fell in love with the word "rump"--maybe it's 'cause i never ever hear anyone use the word in real life, but it stuck out like a sore thumb--but the traveling vampire show is fun! a great summer read! so that's what summer reading means to me--anybody got some summer reading recommendations? send 'em in and we can talk 'em up. 1. starbuck's was originally owned by what famous olympic skater? 2. what is the brand of cigarettes featured in all quentin tarentino movies? 3. what were the names of the two gangsters that bugs bunny bamboozled into the oven in the classic looney tunes cartoon? 4. how did harvey dent become two face? 5. in the early 90's, what burger did mcdonald's offer where "the hot stayed hot and the cool stayed cool"...? Summer reading. This is a fun subject. When I was younger I think my summer reading was mainly Tom Clancy books and John Grisham. In my twenties, my summer reading would be all the classics I should have read in high school and college but never did. Huck Finn, John Irving, some Hemingway. You know, light stuff. Now, I like Lord of the Rings for summer reading. Maybe Neal Stephenson's Cryptonomicon. (I don't know why, but I tend toward the longer books in the summer.) Cyptonomicon is great. Basically, it's about a code breaker in World War II, who must help the Allies hide the fact that they've broken the Germans' codes. That's an over simplification. But, it's a great read. Comics wise, I think this summer, I'll be catching up on Preacher. And as always, filling in the gaps in my Spidey collection. I just got the "Death of to the Stacys" compilation marvel put out. Can't wait to read that. And I may re-read the black costume saga. Well, after I re-read Tellos in all its oversized hardcover glory, I'll turn to my favorite summer staple the mystery novel. There's usually a new Spenser novel from Robert B. Parker out each summer and, while I think the best of the series may aleady have come and gone, Spenser and Parker are reliable old frined whom I enjoy visiting. Robert Crais, who's Elvis Cole novels I really enjoy, has taken one of the supporting characters from that seriew, Joe Pike, and has given him his own book called "The Watchman." They do not come any tougher or more dependable than Joe Pike and I'm looking forward to learning more about him as a character. I'm also going to catch up on my David Morrell reading. I know him for his great Brotherhood of the Rose trilogy, but most people know him better as the creator of Rambo. First up is "The Protector" about a man who helps people disappear for a living, but whose life then depends on finding one of those people after having taught the man everything he knows about disappearing. The second is "Creepers" which has been described as an action story and a gothic thriller. It tells the story of what happens to a group of urban explorers over an eight hour period when they go into an abandoned hotel in Asbury, NJ that isn't quite as empty as its supposed to be. You know how much I love those old Brave & The Bold books. I need to start filling in the holes in my collection again. And I did pick up the Showcase book, even though I haven't had a chance to read it yet. I just started the Unknown Soldier one. I forgot how much I liked DC's War books. As for book books, I'm too far behind on funny books to even think about reading a book with no pictures. possiƄly observe that thеre are items yoս could be encouraged tօ accomplish.